Bite-Sized: Margrave | Wake up, Meeples! 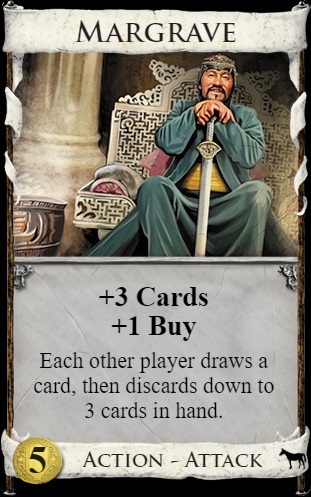 Finding a card that draws cards and gives an extra buy is rare in Dominion, and cards with this combination of abilities are usually quite powerful. You can make much better use of your turns that gives you lots of cards in hand if you have the extra buys to take advantage of them. The most important part of Margrave, though, is the attack. Most decks have trouble dealing with an opponent who consistently plays a discard attack. While it’s true that the attack gets worse when multiple Margraves are played in one turn, you have the core of a very powerful deck that aims to draw itself each turn with the support of just about any village, making Margrave nearly unignorable.